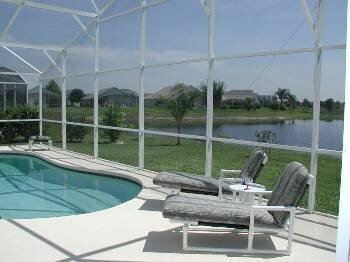 Lakeside villa with pool close to Disney and other Orlando attractions. Now with 50" television and high speed internet access. The beauty of the villa is its location; Disney is just three miles away. This is particularly beneficial in the morning as you get to avoid the major queues of traffic from people staying further afield. As a result it is easy to visit the parks in the morning, come home for a swim and relax in the afternoon and still be easy to return to the parks for the firework spectaculars in the evening. Shops and restaurants within two miles. Both East and West coast are within a two-hour drive. Easy to get to and from the airport within 30 minutes. The property is a Luxury Executive detached lakeside villa with heat-able pool in tranquil location. It has high ceilings in the public areas so it feels both spacious and light and airy. Additionally it boasts a spacious four bedrooms and three bathrooms.Two of the bathrooms are en-suite to make two master suites; one with a king size bed, the other a queen size bed.. Luxury kitchen and all facilities. The lounge area has recently been upgraded and has a 50" television for your viewing enjoyment. There is high speed internet access as standard. The villa is single level, so it is ideal for guests with mobility challenges. Formal hedges border the property on both sides at the rear. This ensures the deck area enjoys a high degree of privacy, whilst permitting an uninterrupted lake view. The nearest golf course is within a mile of the property. There are numerous other golf courses within a 15 minute drive of the villa. The villa backs onto a lake, therefore affording a great degree of tranquility and privacy along with a great view. Additionally, it is set in the heart of the community so it is set away from road noise disturbance. The entire property has been completely refurbished in 2013. Redecorated internally and externally, ceramic tiling to living areas and new kitchen with granite worktops. It feels like a brand new home.